Ian Kinnear is an established Angus based pottery artist. 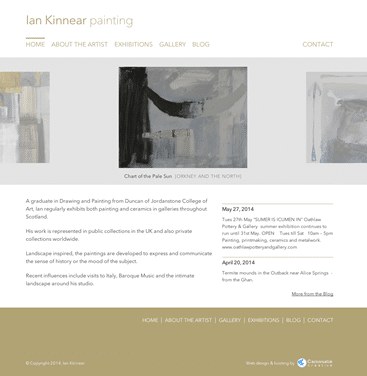 Ian approached us earlier in the year looking for a new website to help him raise the profile of the other discipline he practices – oil painting. At our initial meeting, he said he wanted to keep the website clean and simple, avoiding unnecessary distractions and making the paintings themselves the main focus. Developing a design for an artist might seem to fraught with the potential for “artistic differences” but we took Ian’s ideas on board and worked with him to get the typeface, colours and layout that he was happy with and would scale well from mobile phones up to wide screen desktop computers. 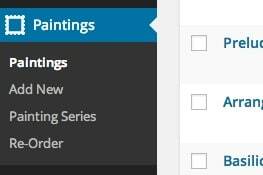 By extending WordPress we included a simple database of paintings, allowing Ian to quickly and easily add and organise his work for display online. The paintings can be categorised into “series” so that related work can be presented grouped together. As with all our work, the website is full responsive. In Ian’s case, an advantage is that pages will load images appropriate to the size of the device being used – so lower resolution images are presented on smartphones and larger images served to desktop and laptop PCs.